Rachris World Travels: I need a Farrow and Ball paint chart. I need a Farrow and Ball paint chart. Oh my goodness. Mexico just keeps getting better and better. 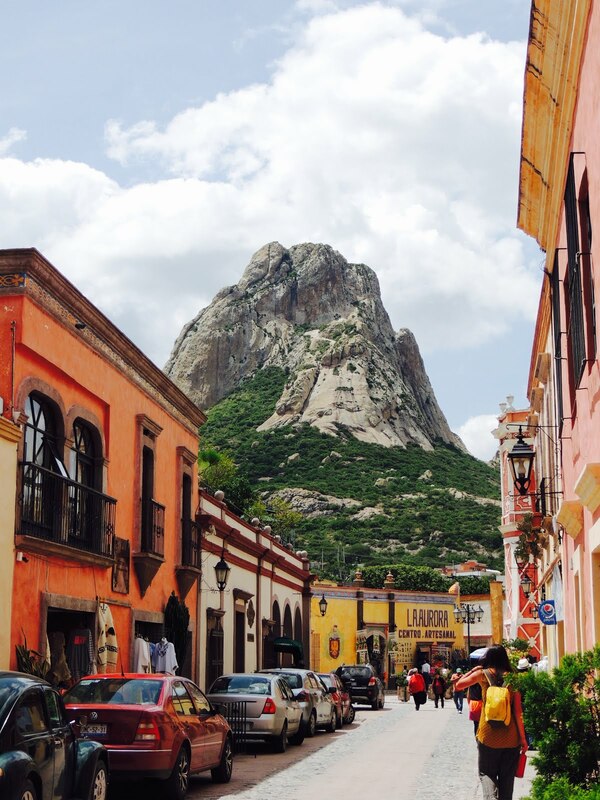 Queretaro, city of 2m people, sprawls over the hillsides as far as the eye can see. 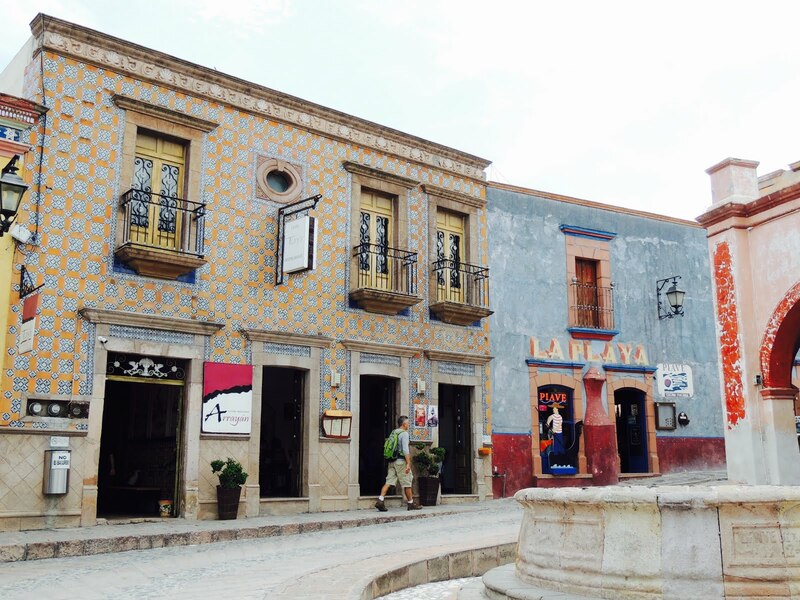 The bit we stayed in, is the old Centro area and is absolutely charming. Not a phrase that I would normally use. But, I have to start slow with the superlatives because Mexico, it seems, is stuffed full of fantastic architecture. Not the whizz bang type that reaches for the sky in extraordinary shapes. This is the sort that comes in colours of burnt sienna and bright ochre; is made of crumbling painted cement and brick, is aged, flat topped and overseen by catholic churches ranging from magnificent to simple, that are still populated and not just mausoleums to a bygone belief. There is, as I type this, a car outside the house with “La Cucaracha” blaring out of the window. Fantastic!!!! 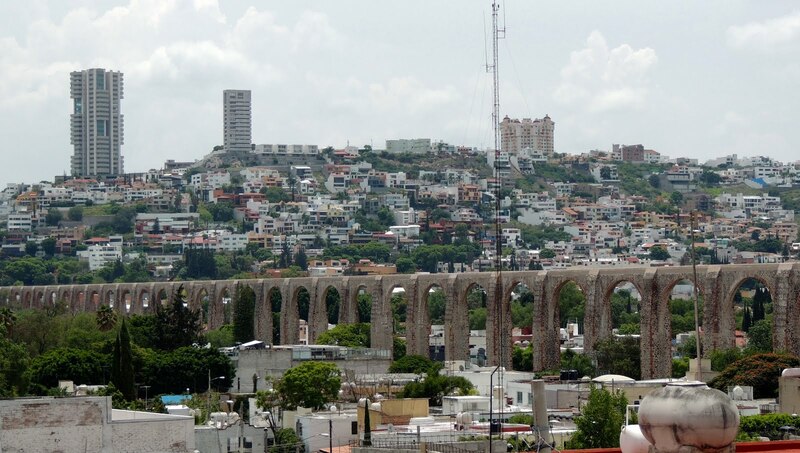 There is an aqueduct that spans one of the valleys in which Queretaro covers that has 74 arches and defines the edge of the old city where there are winding brick roads with restaurants, cantinas and shops that squash onto the exclusively one way roads. There are elegant plazas with fountains and seats situated around the edges and like Pachuca and Mexico City numerous police seemingly doing little. It’s weird. We all have a sixth sense that alerts us to danger. Something that heightens your awareness of your surroundings. Rachel’s is very acute (having been mugged and duffed up a bit in London once). But neither of us have felt a thing. People are friendly, helpful, laughing, kissing and very social. Do the police make it so or protect what naturally is? (Actually, just read a book called The Circle which is about the rise of a powerful internet company and it poses similar thoughts – worth a read). Our room is right in the middle of it all and 5 minutes after we arrive we are sitting in a plaza, while latin guitar music plays in the backgound. We kick back and drink una cervesa (Corona) with fresh lime in a salt and chilly topped glass in the sun whilst chatting to two slightly tipsy locals. Both have the shits and are alternatively knocking back a concoction of anise, rum, tequila and mango juice and large swigs of Peptobismol. Our Spanish is starting to pay off and we manage a proper (although limited) conversation (alcohol makes people very forgiving) before they buy us some more drinks and rush off- presumably to be sick. 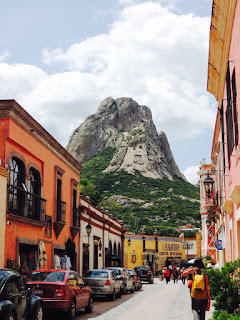 A short bus ride from Queretaro is the incredibly quaint and beautiful village of Sebastian de Bernal which is dominated by the 433m high Peña de Bernal one of the tallest monolith’s in the world. We had heard that it was possible to climb to the top of this rock first by following steep paths then scrambling up some steeper bits and finally by climbing up large metal staples fixed in the rock face. We set off up the slope with gradually lessening numbers of people and finally reached an outcrop where Rachel called it a day. I preserved but after a scramble and the first three staples reached a point where the next three staples had been removed – leaving an 8 metre wide, virtually vertical gap that fell away towards some rocks. And…. I stopped myself!!! I had a good talk about the dangers, chances of falling, ramifications of my actions etc and backtracked to a very proud Rachel who often says to me “Be careful” knowing that my reply of “I will” means “I probably won’t”. Even though we couldn't get to the top it was still a great clamber with amazing views and a must do activity (although having decent climbing shoes, a small strap and carabineer might be useful). Bernal, similarly, is an amazing village. So pretty it makes you gasp. And words will not do justice to the pictures you can find in the gallery. 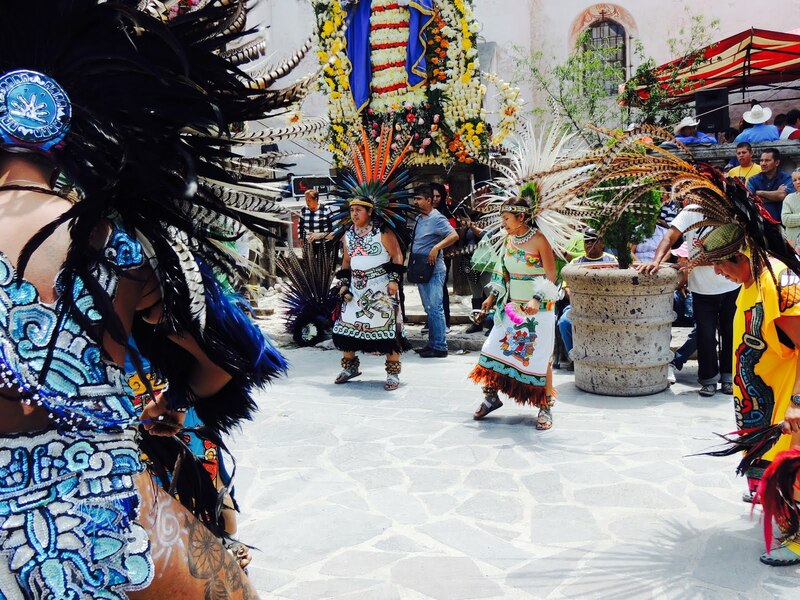 Back in Queretaro we find out there is an international jazz festival starting the next day so extend our stay and prepare to dance. We pass the day wandering until its time for the festival to start (which would be simultaneously at two or three locations in the town). I could feel the excitement rising….and then nose dive with the blah blah speeches by dignitaries followed by a thirty minute set by an improvisational jazz orchestra. 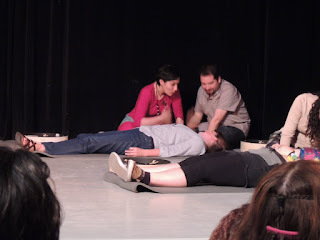 I cannot say this too strongly I F****ING HATE IMPROV. JAZZ. We envisioned Dixie style, or Swing Jazz or possibly Acid Jazz and plenty of it into the night. Not half an hour of people sounding like they all were playing different songs on badly tuned instruments. Not even half an hour really because I only lasted 15 minutes before skulking off but glad we hadnt booked for the whole weekend. 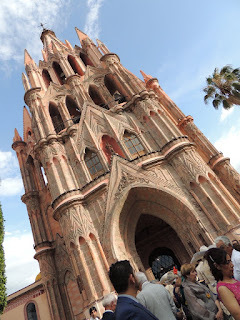 San Miguel de Allende. Voted one of the most beautiful cities in the world rightly deserves the title. Virtually every street is a picture awash with colour, amazing courtyards, wonderful colonial two storey homes and delightful gardens. Flowering pots stand on the parapets of the roofs and flowering bougainvillea adorn the facias or climb around ornate wooden doorways. We have the run of a lovely traditional townhouse with an internal garden for three days and are starting to seriously think that Mexico could be on our list of places to stay and start a guesthouse or something. This town, in particular has a thriving arts culture so there are theatres, workshops, regular concerts and although it does have a higher than normal expat community it does mean there are amenities here that make for easy living. We will see. 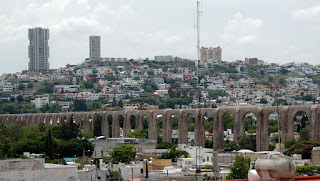 We still have a lot of Mexico in front of us. “There’s this little dusty village about 20 kilometres from here that’s got this amazing church in it”. She said. “A church! 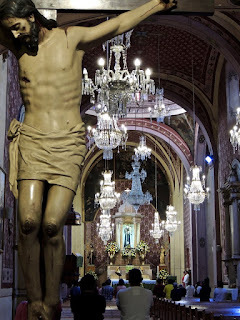 That’s different” I said somewhat sardonically having seen lots of churches in Mexico. “No. It’s got these amazing murals painted all over the inside” She said really enthusiastically. “Look it’s like a small Sistine chapel”. She says showing me the web page “How cool is that? And it’s in a little village in the middle of nowhere”. 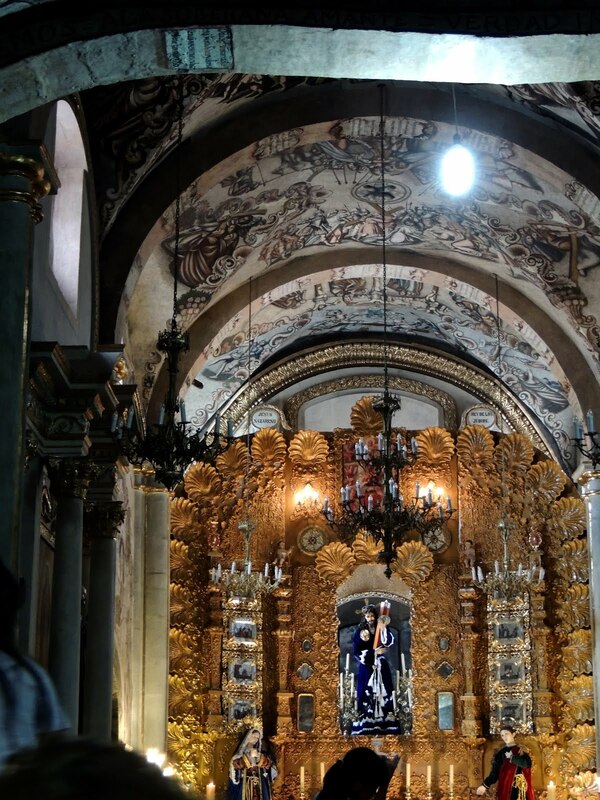 The sleepy village was mid fiesta and the population of about 40 had swelled to 20000. The church being the focal point of the day had moved its alter to the outside and closed the doors which rather defeated the point of being there….. 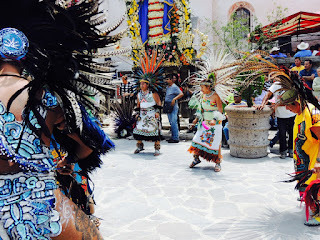 But with lots to see, magnificent floral tributes in the central square, Aztec style dance group and lively mariachi band it was a fun place to be. After a somewhat lengthy sermon given to many gaily dressed old women and pious Catholics the church did disassemble the temporary alter and allow egress to the masses. So we were able, at last, to marvel at the remarkable interior - albeit in a driveby fashion with thousands of other jostling devotees. Shamanism. So being fairly open minded folk we noticed that there was a presentation in Spanish and English being given on Shamanism at a small theatre near us. 25 people in the audience 10 people on stage. Sadly because this was a public demo they used the hypnotic energy of drums to help achieve their preferred state instead of Ayahuasca or Peyote. We got to hear about their experiences, states of trance and watched several demonstrations where they ‘healed’ members of the audience. Rachel got selected for one where they would answer a question in the subject’s head. They didn’t answer her question. Not surprising, I haven’t got a clue what goes on in there either. But the two healers who were working on her both simultaneously looked incredibly sad and said later that they sensed a great sadness in her. Flummoxed us because she is basically simple and always laughing but there you go. Interesting. Hahaha....laughing at Rachel's profound sadness. She is hiding it extremely well. 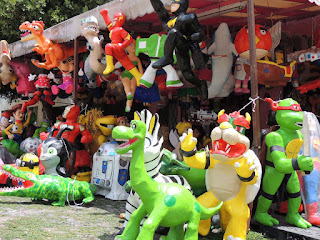 I just adored those home-made piñatas...they were all over El Salvador. Interesting what you write about the danger. I felt the same; I couldn't sense it, but when I started doing some volunteer work with a human rights bent, well, then I knew it was everywhere. It was the same in el salvador. it is so, so violent there, but I just couldn't sense it on the streets, or with the way people looked at me or anything. It was weird, and like Rachel, I feel like I have a decent antenna for that kind of thing.